News > New product lines launched! Breaking news! New Product Lines Launched. Two new styles have been added to our bag range! Designed exclusively for Montrose Bag Company, the Iona Bloom takes influence from our Iona Shopper range. The Flora bag is smaller and comes with a reinforced PVC base for a slightly sturdier bag. Both styles are available in three floral colourways (with a choice of contrasting webbing/handles). 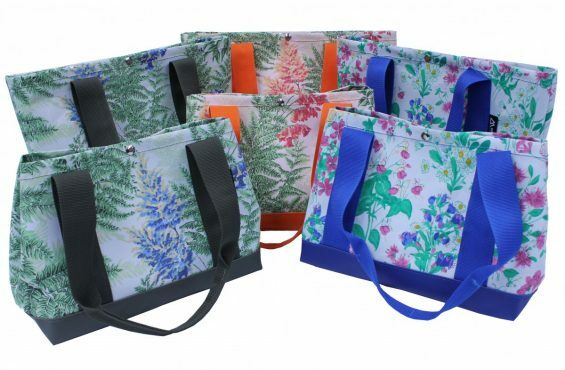 At just £24 + vat each, the Iona Bloom and the Flora are stylish multipurpose bags. Not only do these bags look good but they are made with the same skill an expertise as ALL Montrose Bag Company Bags and Rope & Sail products – meaning they are made to last.